Submitted by Alexander on Tue, 08/25/2015 - 21:05. Here is our recommended list of the best delay pedals, whether you are looking for the inspiring warmth of analog delays or you need the precision and versatility of digital delays, you can find what you want in this list. Analog Delay Pedals are mostly based on bucket brigade delay circuits that were introduced in the '70s. These circuits eventually replaced high maintenance tape-head-based delays. Compared to their digital counterpart, analog delays produce shorter and stiffer echoes, but they trump modern tech with their natural sounding and warm tone. If you're going for classic or old school vibe, then these are the pedals that you should be eyeing. Digital Delay Pedals utilize the latest in digital sound processing technology to produce longer and more transparent sounding delays. Following the steps of amp modeling, some digital delay pedals can mimic analog delays and even go as far as emulating old tape head echoes. Digital delays offer flexibility and extensive control over your sound, crucial features that tipped the scales in their favor for many guitarists. 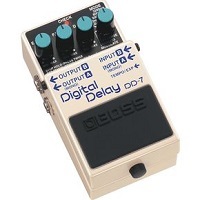 If you want total control over your sound, or if you don't want your original tone colored by the delay effect, then go for a good digital delay. As expected, there are delay pedals that blur the lines between the two, utilizing genuine analog circuits while employing digital controls. They offer the best of both worlds, albeit with some minor compromises like loosing the straightforward plug and play capability of analog pedals to achieve digital flexibility. The original Deluxe memory Man pedal was popular for its natural sounding delay and response. Electro-Harmonix has since improved on the design with various upgraded versions, the most popular of which is the Stereo Memory Man with Hazarai, with its combination of delay and looper features. Moog is known for their premium priced analog gear, typically used by elite artists that include Jeff Beck, The Doors and many more. Thankfully they have been expanding into the realm of more affordable pedals with the Minifooger line. The MF Delay Minifooger is part of this foray and it carries the company's premium quality responsiveness and tone while having a more accessible price point. This impressive sounding analog delay pedal features true bucket brigade chip, meticulously built to exacting specs that result in top notch build quality and consistency. This pedal produces clear delay that blooms out and fades naturally with every repeat, resulting in a very organic and beautiful sounding trail of echoes. It has up to 700ms of delay, so you can set long decays that build up much like reverbs. Making this delay pedal stand out further is the addition of analog drive which can go over 22dB. And finally, it supports expression pedal connection for realtime control over your feedback or time settings. Although this pedal lacks modern versatility, it is the best in what it does, which is providing great sounding delays. The original Deluxe memory Man pedal was known for its responsiveness and natural sounding delay, and for over three decades now, it continues to be among the most sought after delay pedals in the market. Electro-Harmonix has since improved on the core design by adding features that are not usually found on analog delays, including tap tempo, expression control and effects looping. The Stereo Memory Man with Hazarai is the most popular of these offshoots, featuring advanced delay and looper features paced in a single stompbox. This feature packed pedal gives you incredible value for your money, it is a multi-tap delay with reverse echo that can also double as a performance looper with up to 30 seconds of loop time, and as the name implies, it all works in true stereo. It even comes with vintage tape echo filtering for more convincing recreations of old tape echoes. The pedal's analog delay circuitry is paired with digital controls that offer eight programmable presets, for easy storage and recall of settings. Although this pedal is a bit pricey, the cost is easily justified by its quality and added features. If you're looking for a delay pedal and you don't have a looper yet, then this pedal is a must have! Compared to more established brands represented in this list, Blackstar is a newcomer. However, being a newbie did not stop them from gaining quite a foothold in the guitar pedal market, with pedals like the HT-Delay steadily climbing up the ranks. Gus G, Bootsy Collins , Neil Zaza and more virtuosos have been joining their fold to further establish the brand. The HT-Delay is a premium tube driven pedal that produces audiophile rackmount level sonic quality at a more guitarist friendly stompbox format. The tube adds organic saturation to the effect, resulting in truly organic sounding echoes that can be overdriven based on your playing style. The more aggressive your pick attack is, the more the repeats compress for a very natural echo decay. My only compaint is the premium price tag, but with the quality of the sound and build of this pedal, you are getting your money's worth. Start saving up if you are looking for a delay pedal with genuine tube feel and tone. Although I don't personally use it, I've seen and tried the MXR Carbon Copy on a number of guitarists' rigs, and I am one with them in having nothing but good words to say about the pedal. While there's nothing particularly out-of-the-ordinary about the pedal, it specializes in getting the job done, and do so consistently night after night. This reliable delay pedal is a true workhorse, ideal for guitarists who are looking for a no-nonsense yet great sounding delay effect. At the core of this pedal is the tried and tested bucket brigade technology, miniaturized to fit into a standard sized pedal and modernized to survive the rigors of regular gigging. While it may not have the versatility of other modern delays, it makes up with straightforward operation, you don't have to do much tweaking to get inspiring lo-fi delay sounds. It is usually applied subtly for added texture to solos, and it works great when paired with bright pickups and trebly amps, which it tames. If you are looking for a tried and tested workhorse delay pedal that doesn't cost an arm and a leg, check out the MXR. With high caliber artists like Paul McCartney and Brian May on their roster, Vox Amplification have expanded and crossed over into the stompbox market. The pedals that they offer are mostly digital, born out of the technology used on their amps' built-in effects. Among the most notable to come from their production line is the Vox DelayLab, which is considered by many as the most versatile delay pedal in the market. Vox did not pull any punches with DelayLab, instead they went for the most number of delay types that they can cram into a single unit. The result is a pedal with 30 delay types that cover vintage tape echoes to clean modern echoes and everything in between. Thankfully, its not just about getting more, because many find the various delay types offered to be convincing enough for use on stage. Players who want to experiment will find the extra features to be interesting, including distortion delay, dual delay, and a 28 second stereo looper. Although I'm not too happy about the price tag, the feature-packed Vox DelayLab is certainly a worthy investment. If you are not familiar with Eventide, then maybe the iconic guitarists that use their effects will ring a bell, including Jimmy Page, Frank Zappa, Brian May, Eddie Van Halen, Steve Vai and many more. One of their most popular in their lineup is the TimeFactor Twin Delay, a studio quality digital delay pedal with extensive controls and connectivity. From analog to digital to out-of-this-world, the Eventide TimeFactor covers them all with its ten artist-approved delay modes. To better utilize these studio-quality delays, the pedal houses 10 control knobs that let you easily tweak your sound in real time. Other features include Tap tempo, Looper, MIDI, external footswitch and the option to be controlled via an expression pedal. I was thinking of complaining about the bulk and price tag, but I can see why it commands a steep price - thanks to its high-quality sound and reliability. If you want to play with what the big boys, you have to play with their toys, save up for the Eventide TimeFactor Twin Delay. With exposure from iconic guitar wizards like Joe Satriani, Steve Vai and more, DigiTech continues to thrive as a guitar effects builder. While the Whammy is without a doubt their most popular creation, the TimeBender is one of their hidden gems. This powerhouse pedal comes packed with multiple delay types that can recreate virtually every type of delay, and they are implemented in ways that can be better manipulated so they can be better serve the ever growing needs of today's musicians. Timebender is actually a multi-effect pedal with 10 delay types, allowing you to switch between various delay types that include Moving Head Tape, Fixed Head Tape, Analog, Digital, Ducking and more. All the ten delay types feature full-time tone control, modulation, multiplier, tap tempo and repeat ping-pong patterns. Its like having a rack of delay effects for the price of a regular stompbox. As the name implies, this pedal can literally bend time with its Reverse and Time Warp effect, allowing for unique delay textures that you won't get from other pedals. The price and controls of this pedal can be a bit daunting, but those that are willing to invest time and money will be rewarded handsomely. I've seen a number of touring artists go the Line 6 route on their gigs, and I can understand why - their gear provides convincing sounds consistently without the heavy maintenance requirements of bringing multiple pieces of vintage gear. The DL4 is one of the more popular digital pedals that we see on stages. While they probably don't use it during recording, the DL4 has been spotted on the pedalboards of John Mayer, Bill Frisell and many other professionals. 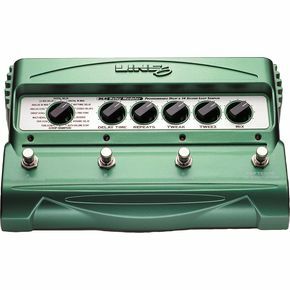 As expected from a pedal designed by Line 6, the DL4 offers a wide range of delay models. You get various types of tube and tape echoes that come with adjustable wow and flutter, as well as modern clean sounding echoes and reverse delay. As soon as you pick which delay works for your song, you can easily tweak the sound to taste, thanks to its intuitive interface. With added features like a 14 second loop sampler, 800ms pre-delay, halfspeed and overdubbing, this is simply a great tool kit for anyone that wants to add versatile delay to their guitar sound. There are some complaints about the pedal's reliability, but with proper handling and care, I am positive that this pedal can last a lifetime. 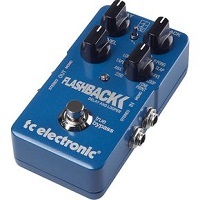 The TC Electronic Flashback Delay is gaining a substantial foothold on pedalboards worldwide. Just within my circles, more and more guitarists have been switching out their green delay pedals for this shiny blue workhorse, and it doesn't take a magician to predict that the future is bright for this pedal, and this is all thanks to the pedal's successful combination of modern convenience, versatility and sonic quality. While having multiple delay modes is nothing new, having multiple delays implemented intuitively into a standard sized pedal without compromising tone is quite a feat, and the Flashback Delay does just that. 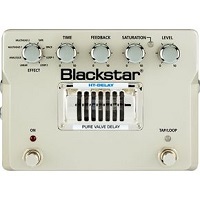 This compact pedal gives you 11 delay types that include a looper along with modern stereo connectivity, true bypass and spill over control. Another feature that helped this pedal climb up the ranks is TonePrint technology, which lets you conveniently change the settings of the pedal via your smartphone or computer. You can start with delay settings created by virtuosos like John Petrucci, Pete Thorn and many more, or you can sculpt your own sound via the editor. While realtime knob controls are limited, the ability to "beam" your preferred settings wirelessly more than makes up for it. Get the Flashback Delay if you're looking for an affordable and super versatile delay pedal. When it comes to affordability, reliability and consistency, nothing beats good old Boss pedals. Surprisingly, the DD-7 went beyond the usual straightforward approach that is expected from the company, rather this one has impressive versatility while still retaining the stompbox shape that Boss has been using for years. Modulation, Analog Delay mode, Reverse mode, External pedal control options and longer delay time are just a few of its notable features. More importantly, Boss was able to implement multiple delay modes without sacrificing tone quality. The same transparent sounding delay is carried over into this pedal, while variations on the sound were introduced. The same tank tough metal chassis is used, to ensure that this pedal outlives all your other guitar gear. Getting a DD-7 pedal is also easy to acquire and use, which when combined with its flexibility and durability, makes it an easy choice for those that want to play it safe. To achieve this, the design and controls were improved, even though the original version was doing well in terms of sales just like other boss pedals, all these features are shrunk to fit inside a sturdy and compact pedal. Getting a DD-7 pedal is also easy to use, which when combined with its flexibility and durability, makes it an easy choice for those that want to play it safe. While it doesn't come with fancy features, the Boss DD-7 is enough to get your creative juices and performance mojos flowing. Posted by Aprhys55 on Tue, 05/21/2013 - 12:30. The Line 6 DL4 also has a Ducking Delay as well as autoswell which is great for slow songs. Get the continuous controller pedal, if you really want to take advantage of the DL4. My only problem with the DL4 is that you can only set 3 presets. Don't fall for the Mod to have 6 presets as it is using the 2nd setting the control Pedal fades into.